LONDON (Jan 26): Sterling hit a six-week high against the dollar on Thursday, as investors awaited growth numbers that are expected to show Britain's economy slowed modestly at the end of last year. Sterling climbed 0.2% on the day to hit US$1.2663, its strongest since Dec 14. That put the pound on track for an almost 4% fortnightly rise — its strongest performance since 2009. It is, however, still trading around 15% weaker against the dollar, than before Britain voted to leave the European Union in June. Against the euro, the pound's falls have been more modest — around 10% since the Brexit vote. 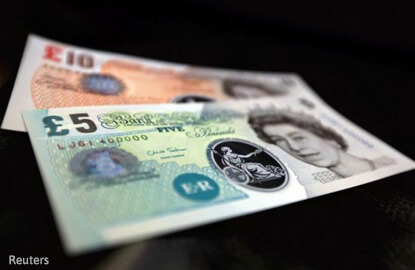 Sterling added 0.2% against the single currency on Thursday to reach a three-week high of 84.815 pence. Economists expect the GDP data due at 0930 GMT to show the British economy grew at a still robust 2.1% year-on-year in the last quarter of 2016, just down from the 2.2% growth of the previous three months. At the same time, Brexit secretary David Davis is due to speak in parliament to set out the government's proposed legislation on leaving the EU.